There were several new openings on December 30, 2018 on the Beijing Subway. Line 6 has been extended an additional four stations west from its old terminus at Haidian Wuluju to Jin’anqiao. This provides an interchange to the S1 Maglev line, which was previously disconnected from the rest of the network. In future there will also be an interchange with Line 1 at Pingguoyuan. Line 8 has opened a new southern extension. At the moment, it is disconnected from the other part of Line 8, so the lines will run as two separate services. There are useful interchanges to Line 7 at Zhushikou and Line 14 at Yongdingmenwai, and in future there will be an interchange to Line 10 at Dahongmen. The line continues to a new terminus at Yinghai. There are also a few additional infill stations. The Yizhuang Line is extended one stop to Yizhuang Railway station, Line 6 adds a new station at Beiyunhe East, Line 7 adds a new station at Fatou, and the northern part of Line 8 is extended by one station to National Art Museum. We’re busy updating all our maps to add the new stations. Check here for status updates! This entry was posted in beijing, newlines on January 2, 2019 by matt. The Guangzhou Metro opened three new lines and extensions on December 28, 2018. Line 14 has been extended and connected to the rest of the system, Line 21 is a brand new line, and the Guangfo Line has been extended. 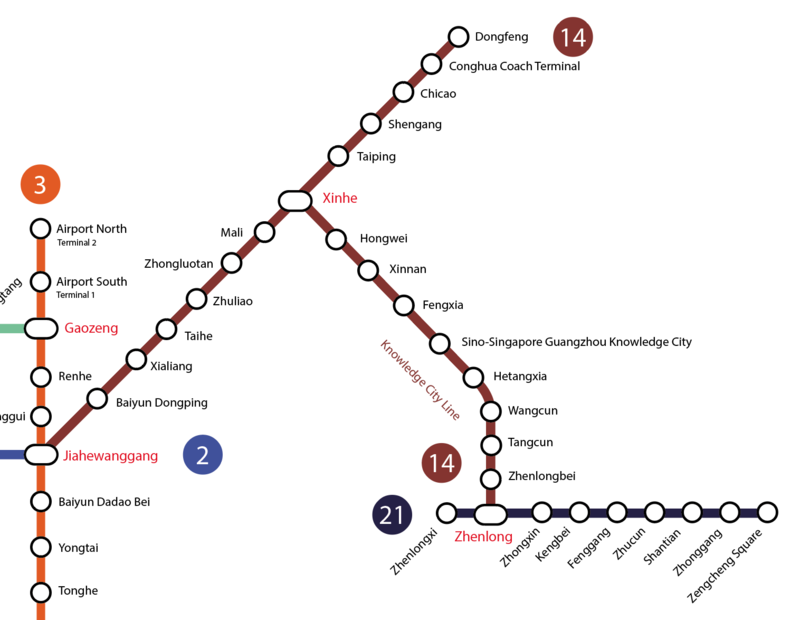 Last year when the Knowledge City branch line of Line 14 opened it was disconnected from the rest of the Guangzhou Metro network. The good news is that the main branch of the line has now opened, connecting to Line 2 and Line 3 at Jiahewanggang. To transfer to the Knowledge City branch, change trains at Xinhe. Additionally, Line 21 has now opened, extending from the end of the Knowledge City branch at Zhenlong. The 9 stations of the line help connect Zengcheng District, the last of the districts of Guangzhou to receive metro service. The Guangfo intercity line which connects Guangzhou and Foshan has also received an extension. The segment from Yangang — Lijiao adds additional useful interchanges with Line 2 at Nanzhou and Line 3 at Lijiao. This entry was posted in guangzhou, newlines on December 30, 2018 by matt. New extensions to Line 5 and Line 13 have opened on the Shanghai Metro on December 30, 2018. There are 8 new stations on Line 5, making the line into a “Y” shape. The new stations extend the line into Fengxian District, with a new terminus at Fengxian Xincheng. Line 13 has been further extended into Pudong. There are new interchanges with Line 7 at Changqing Road, Line 8 at Chengshan Road, Line 6 at Dongming Road and Line 16 at Middle Huaxia Road, with a new terminus at Zhangjiang Road. The Guangzhou Metro opened three new lines and one extension at the end of 2017. Line 9 has opened in northern Guangzhou providing connectivity to Huadu District. With the line’s opening, the interchange station at Gaozeng on Line 3 has also opened, just one stop from Guangzhou Baiyun International Airport at Airport South. This entry was posted in guangzhou, newlines on January 2, 2018 by matt. Today we have a sneak preview of the new Yanfang Line in Beijing. The Yanfang Line is located in the southwest of Beijing in Fangshan District. It will connect with the existing Fangshan Line at Yancun East station. The terminus of the line at Yanshan is more than 42km from Tian’anmen! As the tendrils of the Beijing Subway snake ever further from the city center, some extremely long routes are possible. For example the shortest journey from Yanshan to Fengbo on Line 15 would take over three hours with five changes! This entry was posted in beijing, newlines on December 26, 2017 by matt.